A total of 44 records matched your search. 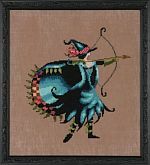 Ana, one of the Bewitching Pixies by Nora Corbett is stitched on 16/32 count Milk Chocolate or a fabric of your choice with a stitch count of 122w x 126h. 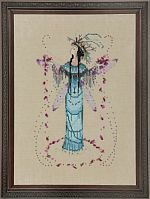 This pattern uses DMC/Anchor floss, 4 colors of Mill Hill beads and 3 Mill Hill Treasures. 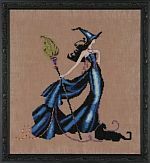 Cleo on of the Bewitching Pixies from Nora Corbett is stitched on 16/32 count Milk Chocolate or a fabric of your choice with a stitch count of 94w x 129h using DMC/Anchor floss. Three colors of Mill Hill beads are used and 1 Mill Hill Treasure. 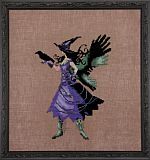 Emi one of the Bewitching Pixies from Nora Corbett is stitched on 16/32 count Milk Chocolate or a fabric of your choice with a stitch count of 129w x 138h using DMC/Anchor floss, one Kreinik #4 metallic braid and 3 colors of Mill Hill Beads. 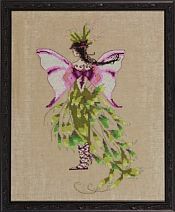 Fern from the Pixie Couture Collection from Nora Corbett is stitched on 16 count or 32 count Antique White with a stitch count of 94w x 158h. DMC or Anchor floss with 2 Kreinik Metallic Braids and 3 colors of Mill Hill Beads are used. 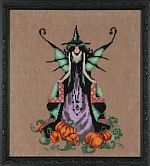 Gigi one of the Bewitching Pixies from Nora Corbett is stitched on 16/32 count Milk Chocolate with a stitch count of 140w x 139h using DMC/Anchor floss, 1 Kreinik #4 metallic braid and 5 colors of Mill Hill Beads. 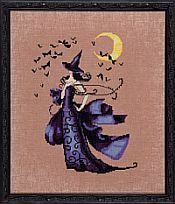 Gwen a Bewitching Pixie from Nora Corbett is stitched on 16/32 count Milk Chocolate with a stitch count of 137w x 124h using DMC/Anchor floss and 4 colors of Mill Hill beads. 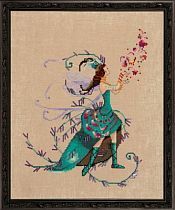 Letter From Mermaids-A from Nora Corbett is stitched on 16/32 count Waterlily with a stitch count of100w x 96h using 17 Crescent Colours fibers, 1 Kreinik Metallic Braid and 3 colors of Mill Hill Beads. Letters from Mermaids-B from Nora Corbett is stitched on 16/32 count Waterlily with a stitch count of 97w x 130h using 17 Crescent Colours fibers, 1 Kreinik Metallic Braid and 4 colors of Mill Hill Beads. Letters from Mermaids-C by Nora Corbett is stitched on 16/32 count Waterlily with a stitch count of 79w x 114h using 17 Crescent Colours fibers, 1 Kreinik Metallic Braid and 3 colors of Mill Hill beads. 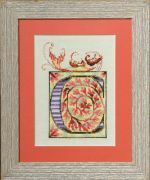 Letter 'A' from Nora Corbett is stitched on 16ct or 32ct Waterlily with a stitch count of 87w x 112h using Crescent Colours Hand-Dyed Floss, 1 Kreinik metallic braid and 4 Mill Hill Beads. 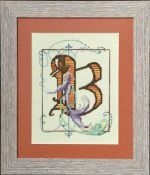 Letter 'B' from Nora Corbett is stitched on 16ct or 32ct Waterlily with a stitch count of 80w x 113h using Crescent Colours Hand-Dyed Floss, 1 Kreinik metallic braid and 3 Mill Hill Beads. Letter 'C' from Nora Corbett is stitched on 16ct or 32ct Waterlily with a stitch count of 95w x 127h using Crescent Colours Hand-Dyed Floss, 1 Kreinik metallic braid and 3 Mill Hill Beads. Letter 'D' from Nora Corbett is stitched on 16ct or 32ct Waterlily with a stitch count of 81w x 135h using Crescent Colours Hand-Dyed Floss, 1 Kreinik metallic braid and 3 Mill Hill Beads. Letter 'E' Letters from Nora is stitched on 16ct or 32ct Waterlilly with a stitch count of 91w x 134h using Crescent Colour Hand-Dyed Floss, 1 Kreinik metallic braid and 5 Mill Hill Beads. Letter 'F' Letters from Nora is stitched on 16ct or 32ct Waterlilly with a stitch count of 81w x 138h using Crescent Colour Hand-Dyed Floss, 1 Kreinik metallic braid and 3 Mill Hill Beads. Letter 'G' Letters from Nora is stitched on 16ct or 32ct Waterlilly with a stitch count of 96w x 135h using Crescent Colour Hand-Dyed Floss, 1 Kreinik metallic braid and 2 Mill Hill Beads. Letter 'H' Letters from Nora is stitched on 16ct or 32ct Waterlilly with a stitch count of 92w x 134h using Crescent Colour Hand-Dyed Floss, 1 Kreinik metallic braid and 3 Mill Hill Beads. Letter 'I' Letters from Nora is stitched on 16ct or 32ct Waterlilly with a stitch count of 80w x 110h using Crescent Colour Hand-Dyed Floss, 1 Kreinik metallic braid and 3 Mill Hill Beads. Letters from Nora-J from Nora Corbett is stitched on 16 count or 32 count Waterlily with a stitch count of 87w x 116h. 11 Crescent Colours, 1 Kreinik Metallic Braid and 2 colors of Mill Hill Beads and 1 Mill Hill Treasure are used. Letter 'K' Letters from Nora is stitched on 16ct or 32ct Waterlilly with a stitch count of 96w x 117h using Crescent Colour Hand-Dyed Floss, 1 Kreinik metallic braid and 3 Mill Hill Beads. Letter 'L' Letters from Nora is stitched on 16ct or 32ct Waterlilly with a stitch count of 85w x 92h using Crescent Colour Hand-Dyed Floss, 1 Kreinik metallic braid and 3 Mill Hill Beads and 2 Mill Hill Treasures. Letter 'M' Letters from Nora is stitched on 16ct or 32ct Waterlilly with a stitch count of 76w x 128h using Crescent Colour Hand-Dyed Floss, 1 Kreinik metallic braid and 3 Mill Hill Beads. 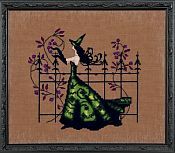 Letter 'N' Letters from Nora is stitched on 16ct or 32ct Waterlilly with a stitch count of 95w x 127h using Crescent Colour Hand-Dyed Floss, 1 Kreinik metallic braid and 5 Mill Hill Beads. Letter 'O' Letters from Nora is stitched on 16ct or 32ct Waterlilly with a stitch count of 95w x 124h using Crescent Colour Hand-Dyed Floss, 1 Kreinik metallic braid and 2 Mill Hill Beads. 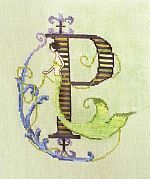 Letter 'P' Letters from Nora is stitched on 16ct or 32ct Waterlilly with a stitch count of 78w x 121h using Crescent Colour Hand-Dyed Floss, 1 Kreinik metallic braid and 3 Mill Hill Beads and 1 Mill Hill Treasure. Letter 'Q' Letters from Nora is stitched on 16ct or 32ct Waterlilly with a stitch count of 86w x 136h using Crescent Colour Hand-Dyed Floss, 1 Kreinik metallic braid and 2 Mill Hill Beads and 1 Mill Hill Treasure. Letter 'R' from Nora Corbett is stitched on 16ct or 32ct Waterlily with a stitch count of 85w x 118h using Crescent Colours Hand-Dyed Floss, 1 Kreinik metallic braid and 3 Mill Hill Beads. Letter 'S' from Nora Corbett is stitched on 16ct or 32ct Waterlily with a stitch count of 62w x 121h using Crescent Colours Hand-Dyed Floss, 1 Kreinik metallic braid and 3 Mill Hill Beads. Letter 'T' Letters from Nora is stitched on 16ct or 32ct Waterlilly with a stitch count of 61w x 119h using Crescent Colour Hand-Dyed Floss, 1 Kreinik metallic braid and 3 Mill Hill Beads and 1 Mill Hill Treasure. Letter 'U' Letters from Nora is stitched on 16ct or 32ct Waterlilly with a stitch count of 86w x 120h using Crescent Colour Hand-Dyed Floss, 1 Kreinik metallic braid and 3 Mill Hill Beads. Letter 'V' Letters from Nora is stitched on 16ct or 32ct Waterlilly with a stitch count of 84w x 113h using Crescent Colour Hand-Dyed Floss, 1 Kreinik metallic braid and 4 Mill Hill Beads. Letter 'W' Letters from Nora is stitched on 16ct or 32ct Waterlilly with a stitch count of 99w x 103h using Crescent Colour Hand-Dyed Floss, 1 Kreinik metallic braid and 3 Mill Hill Beads. Letter 'X' Letters from Nora is stitched on 16ct or 32ct Waterlilly with a stitch count of 90w x 119h using Crescent Colour Hand-Dyed Floss, 1 Kreinik metallic braid and 2 Mill Hill Beads. Letter 'Y' Letters from Nora is stitched on 16ct or 32ct Waterlilly with a stitch count of 79w x 108h using Crescent Colour Hand-Dyed Floss, 1 Kreinik metallic braid and 2 Mill Hill Beads. Letter 'Z' Letters from Nora is stitched on 16ct or 32ct Waterlilly with a stitch count of 70w x 80h using Crescent Colour Hand-Dyed Floss, 1 Kreinik metallic braid and 2 Mill Hill Beads. 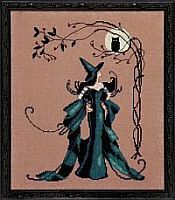 Luna one of the Bewitching Pixies from Nora Corbett is stitched on 16/32 count Milk Chocolate with a stitch count of 112w x 153h using DMC/Anchor floss, 1 color of Kreinik #4 metallic braid is used, 3 colors of Mill Hill Beads and 2 Mill Hill Treasures. 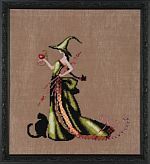 Mari one of the Bewitching Pixies from Nora Corbett is stitched on 16/32 count Milk Chocolate with a stitch count of 85w x 150h using DMC/Anchor floss, 3 colors of Mill Hill Beads and 2 Mill Hill Treasures. 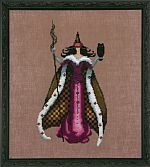 The Rain Queen one of the Black Forest Pixies from Nora Corbett is stitched on 16/32 count Natural Light or a fabric of your choice with a stitch count of 112w x 183h using DMC/Anchor, 1 Caron Waterlilies, 2 Kreinik #4 Metallic Braid and 8 colors of Mill Hill Beads.